Beyond Beyond is a beautifully animated tale from Lionsgate, based on a traditional Scandinavian folk tale. It is a story about wanting the impossible when coming to terms with the absence of a loved one. 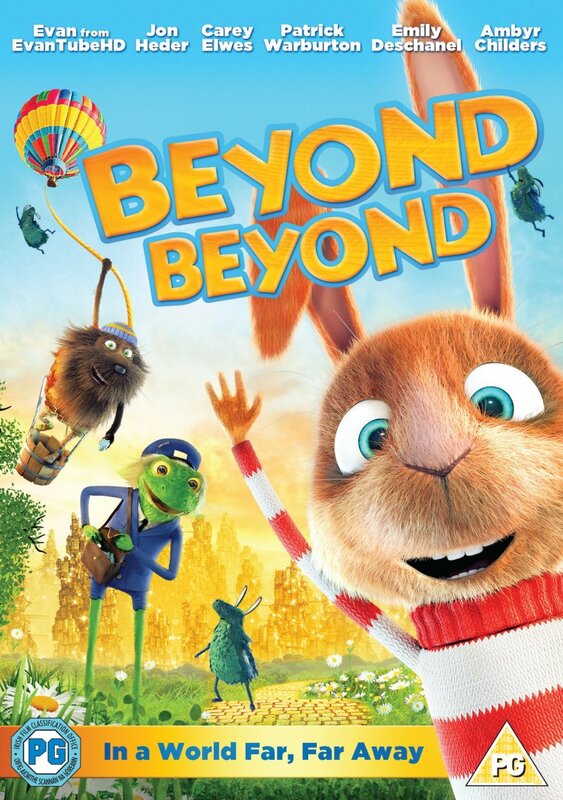 Based on a little rabbit boy, Johan who is not old enough to understand the rules of life, who takes up the fight against the most powerful force. While doing so, he learns more and more about life. A feather takes a little rabbit (Johan)’s mother and he wants he back. After his mother is gone he lives on a ship with his dad. From there Johan sends his mother letters in bottles. They have a supply of nuts and grow their own carrots on board so that they have food. When the nuts get low his dad goes off to find more food. Johan is told not to mess with the radio but he hears someone talking and answers it. The voice (Bill) tells Johan that the Feather King is coming – so Johan leaves his dad a note and decides to take control of the ship himself. Bill then is in sight and gets on the ship with Johan. Bill tells Johan that they have to hide from the Feather King. That the Kingdom of the Feather King is awful and full of rules; that he built it and got away. Johan doesn’t want to hide, he wants the Feather King to find him and shoots into the air. The Feather King swoops down and gives Bill a ticket for the Kingdom of the Feather King. Johan wants to go to the Feather Kingdom and Bill doesn’t, so gives the ticket to Johan. He tells him to stay put and he will eventually get there. The ship sinks and Johan ends up in a queue for a ship to the Kingdom of the Feather King – but the lady says Moira said Johan can’t come on as the ticket isn’t his. That Johan has to wait until his time has come. But Johan sneaks aboard anyway. Johan gets found and The Feather King says that he isn’t Bill and so the woman who lets them on the ship gets in trouble. Johan says he is going to look for his mother, but The Feather King says that he can’t because Moira says so. That if they let him go then Moira will make it so that nothing exists and everything will disappear. The Feather King agrees to talk to Moira. The town starts falling apart because Bill was meant to look after it. Moira says that Johan has to leave. They then capture Bill and brings him to the ship. Johan then has to wait by the ship until his ticket is freed. Johan says the rules are stupid and he won’t stick by them. That he doesn’t believe in Moira. Will waiting and missing his mother, he sees a bottle and swims after it. He hears someone coming so hides. Then he sees that it is his mother who has come and picked up the bottle. They hug, and Johan tells his mother how much he missed it. His mother is upset thinking that Johan had his ticket. Johan’s mother says that it is nice in the Kingdom of the Feathers. That she has kept happy with the messages in the bottle. All the letters Johan sent brighten up his mother’s room. She explains that if the Feather King doesn’t pick you up then you will turn into nothing. Johan spends lots of time with his mother and then he thinks The Feather King is coming so hides. But it turns out to be Bill and he says that The Feather King is gone and now there’s no rules. Bill tells Johan that they can now find his dad. Johan’s mother says that Johan does not belong in the Father Kingdom and must go. Bill said he decided to stop believing in Moira. That Bill had stuffed The Feather King in a box; who tells Bill he has ruined everything. Bill then says to have a party. Bill arranges tickets for all those who he wants at the party. Johan’s mom says that Bill is destroying the balance. Bill renames the place Bills Kingdom and bring over Johan’s dad. Johan is happy that they are all together again. Suddenly Johan and his family wake up to see that the river has come right up. They know something is very wrong and say they have to find Bill. People are queuing up to ask Bill to bring over people there. Bill refuses to explain what is going on.As Bill refuses to acknowledge that anything is wrong Johan releases The Feather King. He tells them that because Moira’s rules have been ignored then everything will be turned to nothing. The Feather King says he can’t leave but gives Johan a small bird and tells him to look after things. Bill says he will put things right by finding Johan’s ticket, but The Feather King fights with him and ends up falling in the pool where the tickets come from. Moira comes up from the pool and starts breaking the city. The lady that lets people in says that The Feather Kingdom won’t handle any more people coming over. So Johan says him and his dad will sort it. Johan and family see the exit as they watch Bill escape again. Bill refuses to help Johan and his family and the thing that came out of the pool grabs Bill. Johan and family go to escape but find that Johan’s mother can’t go with them as she turns to nothing as she tries to cross. The lady who lets people over says that the mother has already had a ticket burned and she belongs in the kingdom now. Moira comes after the lady that lets people in and Johan says that Moira wants the ticket so climbs back in to give it her. Johan says he can make Moira happy again as he has all the tickets. Johan goes back again to free Bill from Moira by placing a ticket on one of Moira’s holes – which in turn releases Bill. The Feather King promises Moira he will get everyone out who doesn’t belong. He tells Bill that he will help – and Johan tells Bill that he has to because he can’t always run away. Bill builds the staircase and Johan and his dad say goodbye to his mom and return home. This tale is very well animated, with good graphics and a great, easy to understand storyline throughout. My 6 year old said that the film was very sad. I think it works on so many levels depending on the age/maturity of the child. I have just had the anniversary of when my mother died and was in floods of tears when I realised what the tale was getting at. I think it is a great way of helping children understand loss and moving on. If you could write a letter telling your mother how much you love her then what would it say? I received a free copy of Beyond Beyond for purposes of review. All words and opinions are honest and my own. The 2 giveaway DVDs are also provided free of charge. No financial compensation has been given. I would apologise for not saying it enough to her throughout my life but she must never forget that I love and appreciate her. I would thank her for all her unconditional love which sustained me through my darkest times. Thank you for giving birth to me, because I am pretty awesome even if you arnt. Thank you for teaching me how to be strong and take each day at a time. I would say i forgive her ( not Elaborating, sorry) and i understand. I regret not telling her that I did understand. I would say things I love her! It would say Thank You for being a great mum and giving me a role model on how to bring my own daughter up just as well, You have big shoes to fill but i’m trying. I’d tell her how much I appreciate the fact that she’s not a “regular” mum – love the fact that we have a shared love of football and pub quizzes! I would tell that she is a fabulous mum who I love very much and I wish I could do more to help her. It would say I’m not very good at saying or showing it but I do appreciate all you do as a Mum for me. I would say that I hope she knew how much I loved her and that I miss her every day. I love you to MacDonald’s and back. I would say sorry for assuming that she would carry on doing things for us without appreciation or anything in return and thanks for sacrificing her freedoms and choices for us. I’d tell her that I appreciate the unconditional love that she has always shown me and how lucky I am to have amum lile her. Thank you for all the love and I miss you. I would tell her how much i appreciate her and go out of my way to demonstarte it. I would thank her for all her help and support over the years whilst I have been unwell and tell her she is the best mum in the world. to remember I love her no matter what.